Ask yourself, since when you haven’t seen the thick cream on fresh delicious boiling milk? When I was a child, I used to hate milk because of that thick cream and refuse to drink it. Thanks to UHT technology(!) the store milk doesn’t even have a cream on top, and it doesn’t even froth properly while boiling. Yesterday evening my husband brought some milk and it was still warm because it was so fresh! With some, I made kefir. And some yoghurt. 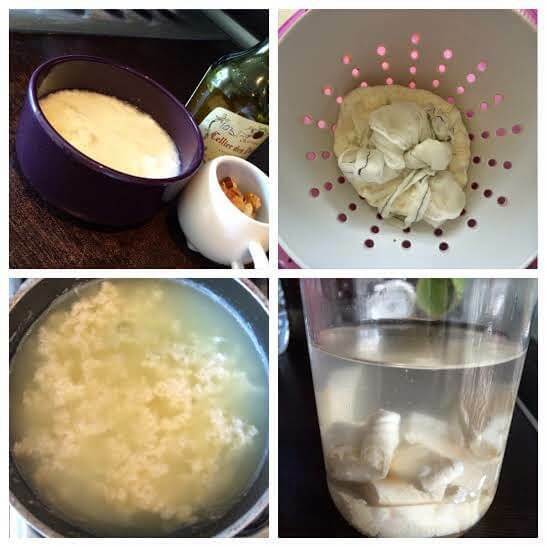 And today I made the cheese I’ve learnt from dear Mrs Naime Colak Isık’s instructive and amazing facebook group. It’s very practical and delicious. I know making homemade cheese sounds difficult but it’s not! I make very small amounts because I like my cheese very fresh. This way I keep making anew as we run out. If you are having a hard time finding raw pastured milk and want to make bigger amounts, you may increase the amount of the ingredients.